Have they ever told you ‘’when you grow up, you can become anything you want’’ and your thoughts were ‘’I wanna be a clock’’? 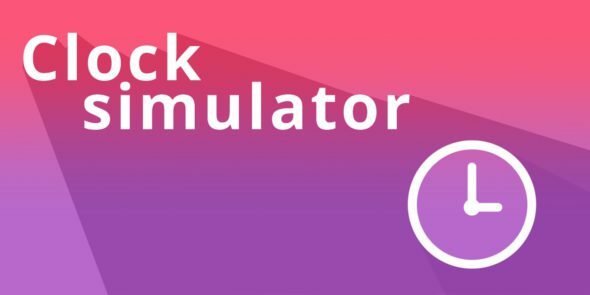 Well, good news for you, Clock Simulator for the Nintendo Switch is finally here. In this game developed by Kool2Play you will have to stay perfectly on time in order to get as far as you can. Is it worth investing in a game that lets you be in charge of time or should you take your precious seconds somewhere else? Let’s find out in this review. Clock Simulator doesn’t have a story. The game has different minigames you can play either alone or with friends with no deeper meaning behind it than to be the clock. They made the right decision by leaving out a story since it is just a bunch of minigames where you will have to act like the clock. If they would have added one it would have ruined the whole vibe of the game. The game uses 2D-graphics. In addition to this, it uses darker and lighter colours to create a tiny bit of depth but that’s about it. When you are playing the game you don’t have to expect big flashy graphics or the most fascinating things. It is all very basic but that kind of makes it look good too and it fits the overall game atmosphere. In most of the minigames there will be a big clock in the center of the screen, and in some of them you will encounter other things that act like clocks, for example rotating gears. That’s about everything that you will encounter while playing. The ticking off the clock, a sound many may dread, especially when lying wide-awake in bed. In the majority of the minigames the only sound that you will hear is the sound of a clock ticking every second, or when you push the button, since you’re playing the clock. As nerve-wracking as this may sound, in some minigames that have a small theme like the Dungeons & Aliens one, there is a bit of a background music, which of course fits in with how the minigame is called. Don’t expect much of it though, since it is all very basic and in most cases it’s more nerve-wracking than the ticking clock. Like the name predicts, Clock Simulator is a simulation game. 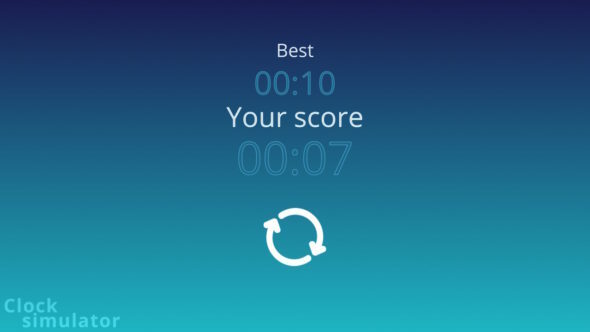 In the game you are the clock and you will have to press a given button every second in order to get as far as possible. There are currently thirteen different minigames you can play, all with a different look and original idea but with the same concept. As mentioned before, it is your goal to be the clock. This can be done by clicking the correct button at the correct time (which is every second). If you fail to do this, in some cases the minigame is immediately over and in other cases there is room for a few errors but not too many. When you are out of ‘’lives’’ you will see your end time or how far you have gotten on the clock. So it is actually a fun game to play with friends and see who can get the furthest and hold out the longest. If you prefer playing with friends, you can either pass on the Switch or the Joy-cons and play in turns or you can play one of the two multiplayer minigames, ‘Last pig standing’ or ‘Clock fight’. Here you can each grab a Joy-con and take on each other directly. 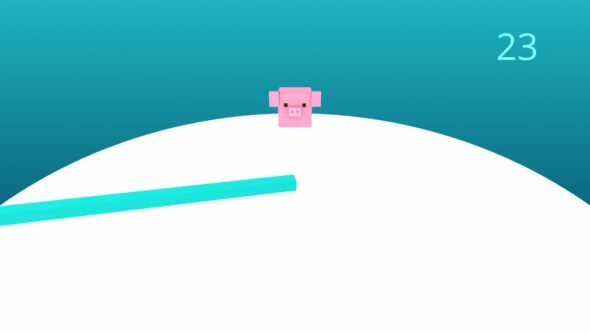 In ‘Last pig standing’ you and your friend will have to jump over the second hand every second, the first player who fails to jump over it and gets hit by it, loses. In the minigame ‘Clock fight’ you will play the basic variant of the game. 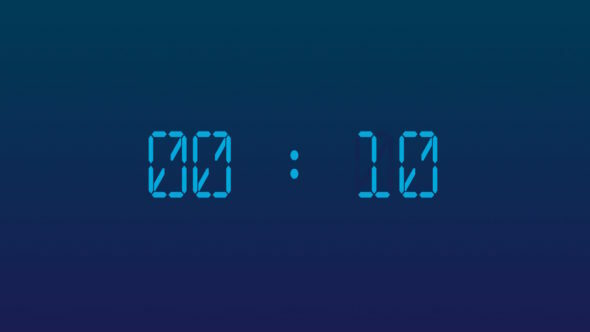 There is an analogue clock on your screen and in this case two second hands, one for each player, and it’s your goal to hold out the longest by clicking every second. Each player has room for 5 errors and the first one who loses all their lives loses the game. Like mentioned before, there are thirteen different minigames with two of them being the multiplayer ones. Let’s have a quick look at the eleven others. Most of them are like ‘Clock Fight’ and you will have to click every second and get as far as you can. Furthermore, there are a few that bring another vibe to the game. Of course you will still have to click every second but they give a bit of a different feeling. First, we have ‘Dungeons & Aliens’. 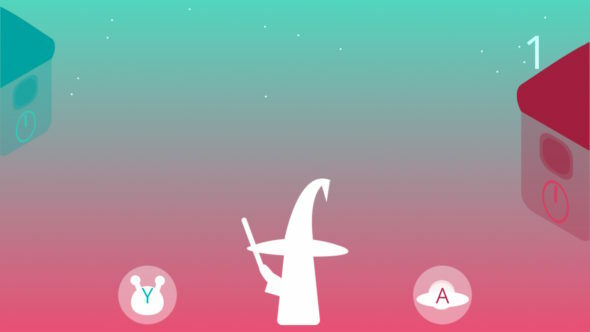 Here you will be a wizard that has to defeat an alien every second by pressing the buttons. 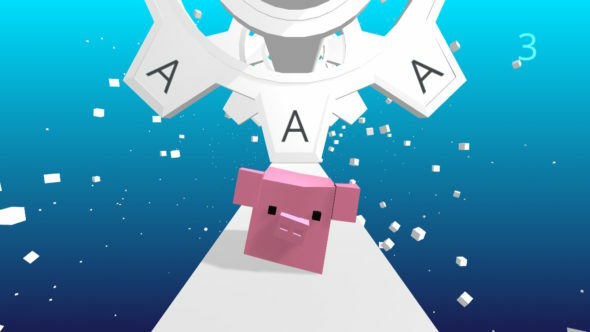 The ‘It’s XYAB time’ minigame will let you play a pig that has made its way through rotating gears, which (surprisingly) has to be done by pressing the correct buttons. The last ‘’special minigame’’ is called ‘Pig got the rhythm’, which is exactly like ‘Last Pig Standing’ but then for solo play. So when you look at the game, the developers made a good decision by making thirteen different minigames, avoiding giving players a repetitive feeling. The only thing which could have made it a bit better was for some minigames to be implemented with a screen giving some instructions. Luckily the premise of the game is quite clear and you’ll know what to do soon enough. Clock Simulator is a fun game to play, with its different minigames. In all of them you are doing the same thing, but they all have a different look. Graphically, the game isn’t anything special but it looks good and finished. When looking at the sound, most of the time it’s just a ticking clock, and in some cases there is a bit of background music that fits in with the theme but don’t expect anything special. After all we can say that Clock Simulator is a nice game to pass the time, quite literally.